1. Pop popcorn using preferred method. 2. Line two cookie sheets with parchment paper or foil. Spread popcorn evenly along pans. 3. Put the chocolate chips in a microwave safe container and microwave for 30 seconds. Pull out and stir. Microwave for another 30 seconds. Pull out and stir again. The chocolate should be melted at this point. If it’s not, microwave for another 10 seconds. Repeat until it’s soft and drizzly. 4. 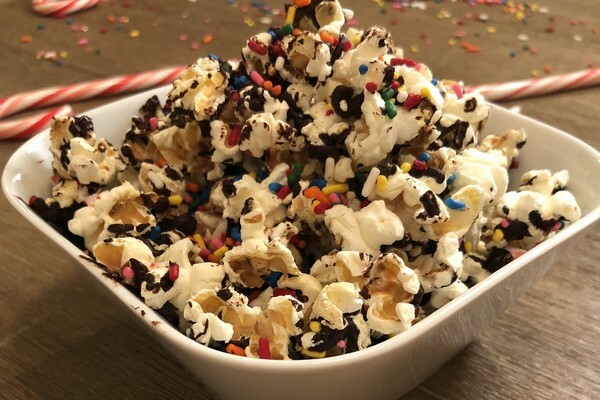 Using a large spoon, drizzle the chocolate over the popcorn using fast motions creating thin lines of chocolate. 5. While the chocolate is still warm, sprinkle the peppermint pieces and sprinkles over the top. 6. Allow chocolate to re-harden before moving. You can pop the trays in the freezer to speed up the process.